Hello and welcome to another month with the Power Tool Challenge team! Our theme this month is Home Decor and YOU are invited to participate! Stay tuned at the end of this post for more details and awesome prizes! 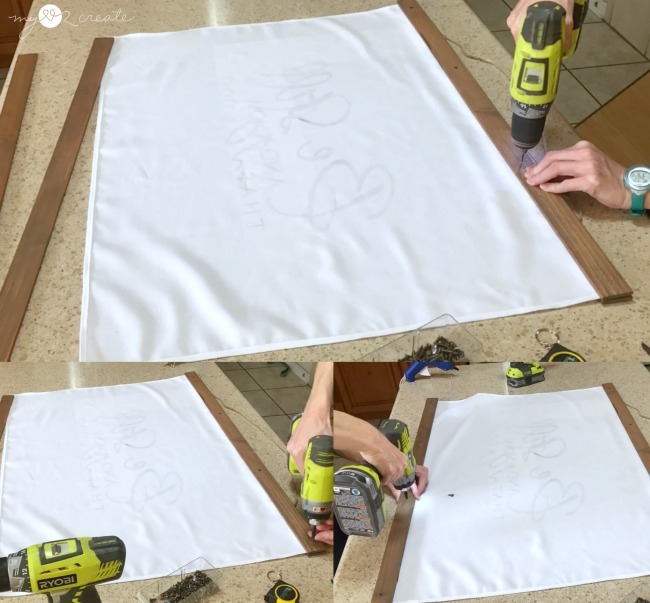 For my home decor project I saved a boring blank wall in my bedroom by making a Fabric and Wood Wall Hanging! Fabric- any size and color you choose, linen is a good type of fabric to use, I would avoid stretchy fabrics like cotton. 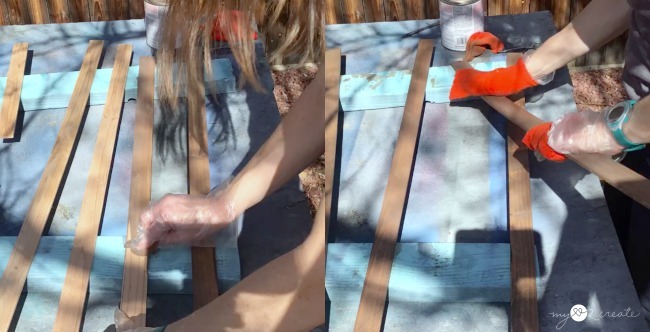 Stack your 4 pieces of wood lath and then use painter's tape to wrap all four boards together. The painter's tape is optional, I just used it to save time on cuts so I could cut all the boards at once, since they are such thin boards. Using a miter saw cut to desired length. The length you choose with be the width of your frame. I cut mine at 33'' because it was a good size for my wall. After sanding the lath boards you can stain or paint them. I choose to stain my boards with this stain . I rubbed it on and then wiped it off with some old socks. While the stain dried I worked on the fabric. 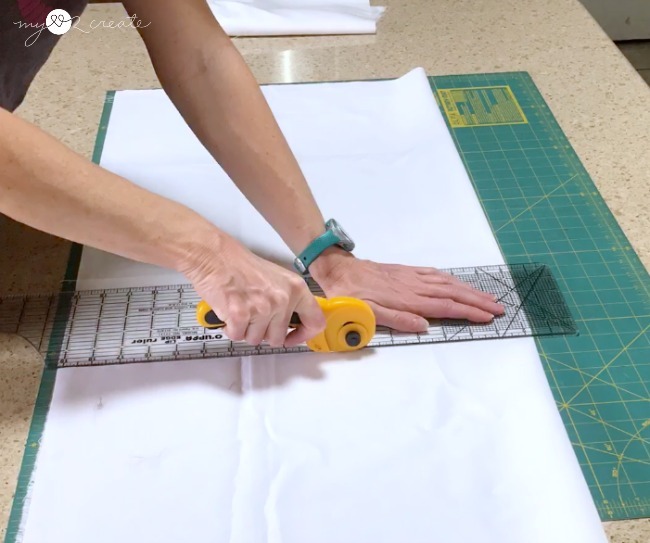 Cut your fabric width to fit your lath pieces. I cut mine 1'' longer than my lath pieces, so my fabric width was cut to 34'' wide. For the height you can go as long or short as you want. I cut my fabric height at about 25''. Hem all four sides of the fabric by folding the edge at 1/4'' and pressing it with a hot iron (top left). Then fold that over and press again (top right and bottom left) pin in place. Then sew the hem in place. Do the top and bottom first and then fold the hem and sew the sides last. This will take a 1/2'' of fabric on all four sides. If you don't want to sew you can use some Hem Tape instead. 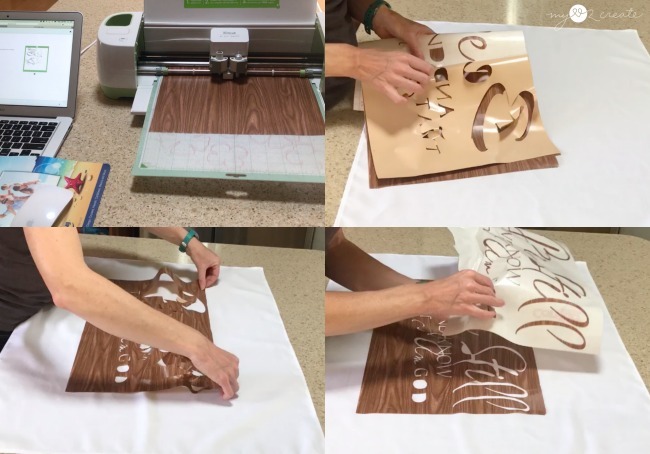 If you own a cutting machine you can cut out a stencil, or you can use any purchased stencil. I cut my stencil with my Cricut Explore Air™ onto contact paper. 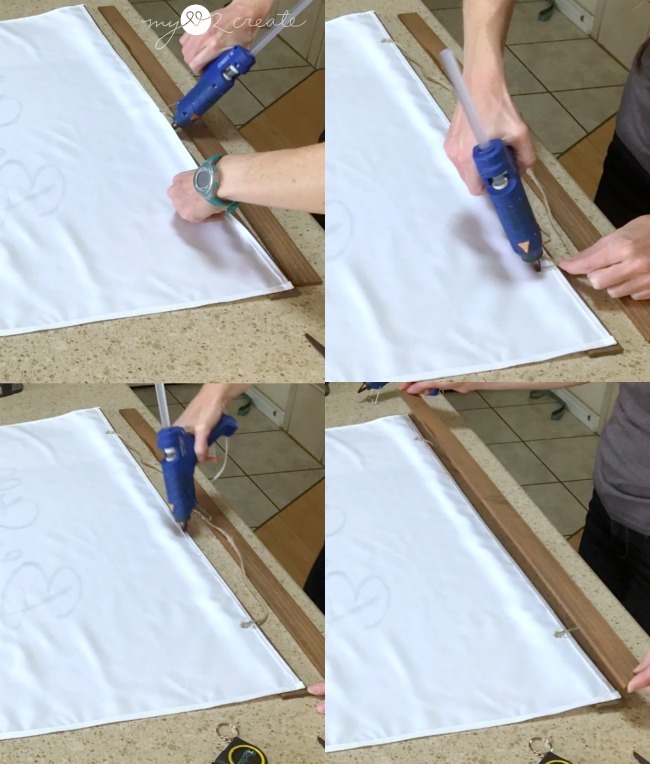 I like using contact paper because it is so cheap and is perfect for stenciling. Once my design was cut I pulled off the outside of the design and placed it on my fabric where I wanted it. 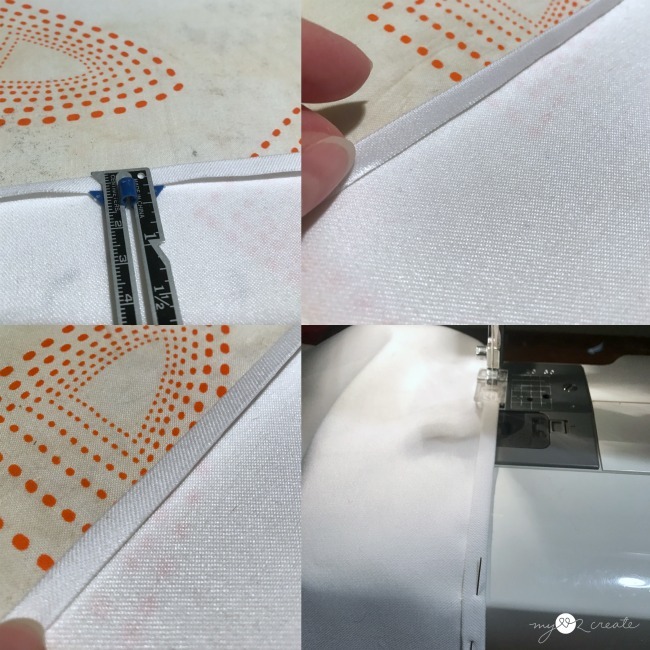 The contact paper is easy to pull off if it sticks together, just be gentle and patient, it takes a little bit of time with a large design, but it is so worth it in the end! Once I had the outside placed I added the insides of the letters to complete the stencil. Now for the fun part...stenciling! The most important thing to remember when you stencil is that you want hardly any paint on your brush, otherwise if you have too much it will bleed under your stencil. Choose your paint, add some to the bottom of the brush, and then brush the paint off onto some paper, then pounce your brush onto the stencil. Repeat until your design is filled in! I had ZERO bleeding on this project and I was so happy it worked! Peel of your stencil while the paint is still damp. Don't have cutting machine? No Problem!! 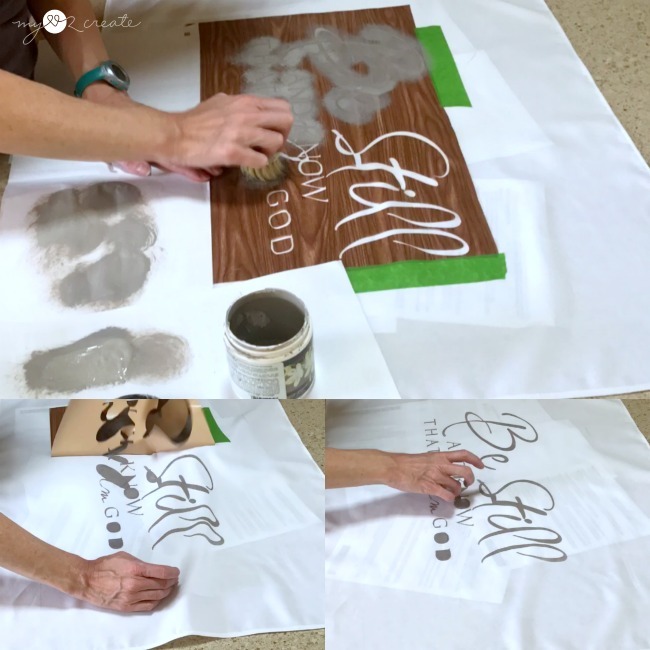 Read my post on How to Make your own Signs for more techniques and stenciling tips! Once your lath and painted fabric are dry it is time to connect them. Place your fabric upside down over your front lath piece and line it up nice and straight. Then add a few beads of hot glue to the edges and the middle to attach the fabric to the front wood piece (top left). For the top only hot glue the twine hanger in place (top right). Then run a line of hot glue down the length of the fabric (bottom left) and attach the back lath piece (bottom right). Do this same process on the bottom of the fabric, except you won't have twine on the bottom. Now you need to add some screws to secure the lath and fabric. I pre-drilled holes and drilled in 4 small 1/2'' screws into the top and bottom parts of the frame. Be careful not to screw through the front of the frame. If you are confident that your hot glue will hold, which it probably will, you can omit this step. I just wanted to be safe, sometimes after a while hot glue will loose its hold, but honestly you could just fix it again with more hot glue if it broke! If you use the screws you won't have to worry about it, either way works! I am loving how this turned out and I made it in less than 3 hours! A perfect afternoon project! I have wanted this scripture hanging in my room for quite a while and when I thought of this project I knew I had to use it. It really looks so much better in person, as things always do, but you get the idea! I am planning on using the left over cut offs from my lath to make a smaller version, but I may or may not use fabric...still debating. This really is a project anyone can do, you just need to DO it!! 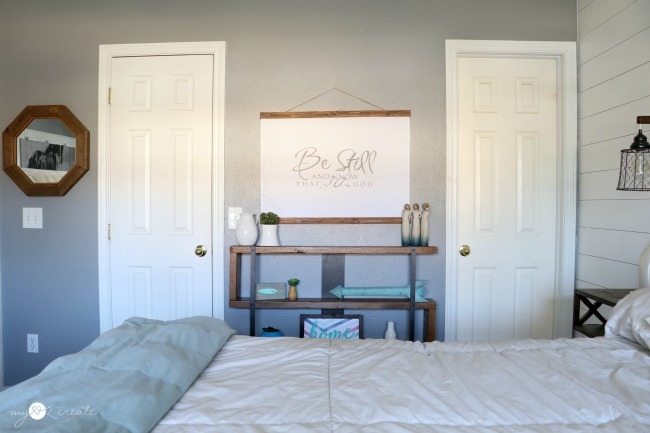 Are you inspired to create your own Decor Project? Then NOW is the time!! 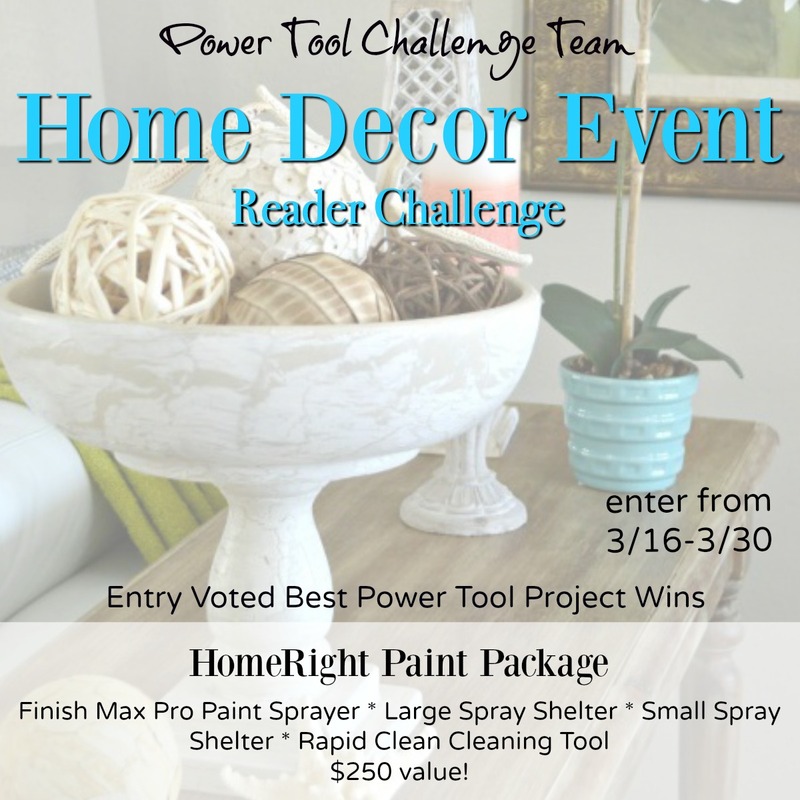 We want you to participate in our Home Decor Event Reader Challenge, and you can win an Amazing HomeRight Paint Package! Seriously you guys you have to enter! I love seeing your projects it is so inspiring! The project can be made from anything as at least 1 power tool was used to build it. 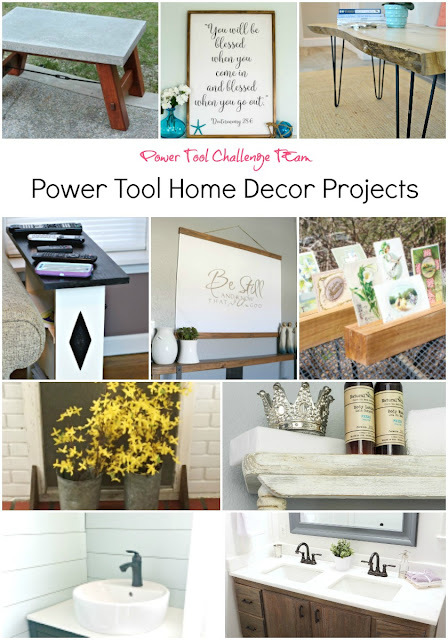 The Home Decor Power Tool Project Challenge is open for entries from 3/16 through 3/30 via a linky link up. Submit an old or new project as long as it's a home decor item. The Power Tool Challenge Team and HomeRight will vote on the best project and one winner will be selected. The winner will receive a HomeRight DIY Paint Package which includes a Finish Max Pro Paint Sprayer, Large Paint Shelter and Small Paint Shelter and a Rapid Clean cleaning tool for the Finish Max. Before you link up your project take a minute to get inspired by all the awesome Decor Projects by the Power Tool Challenge Team is sharing this month! Your wall hanging looks great in your bedroom. 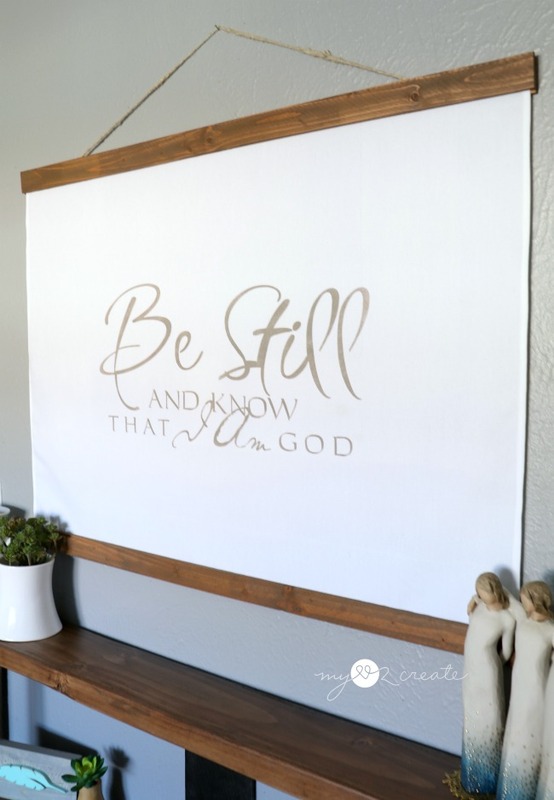 I can think of so many places that I'd like to hang one of these and I love that it is a project that only takes a few hours to make. What a cool project Mindi! I really like the idea of an oversized wall hanging. I can think of so many ways this would look great on a big gallery wall. Pinned and shared! Mindi! This is so beautiful. That turned out beautifully Mindi! 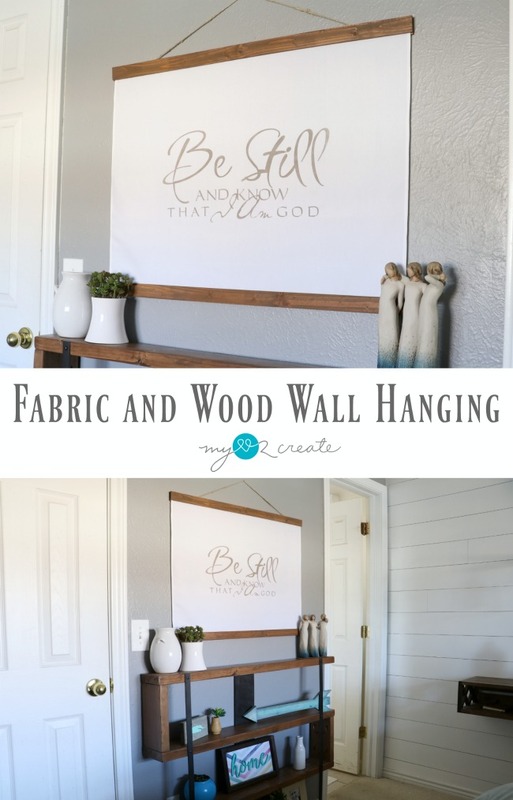 I love, love, love your fabric and wood wall hanging. It's perfect on that wall! You did a wonderful job! You are so right: the happiness of filling a big blank space! 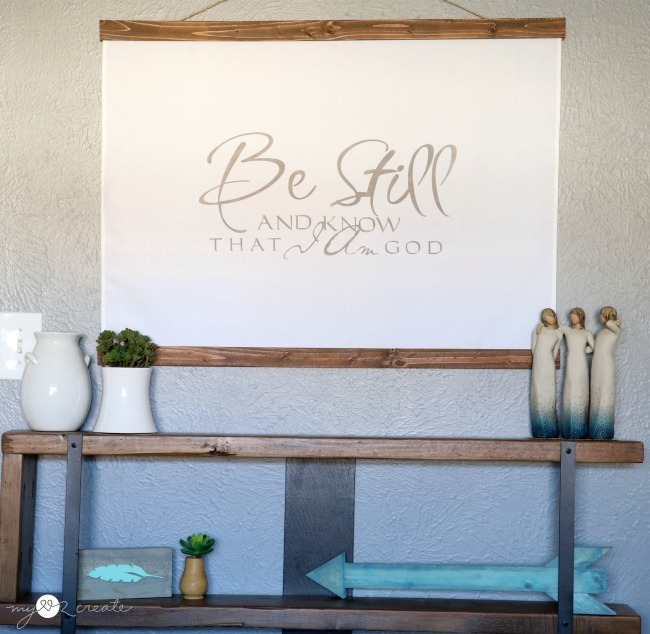 I love everything about this idea Mindi! Especially that verse! I love this! It's perfect in that spot on the wall - and much better to be inspired than bored! :) Great project - pinned! 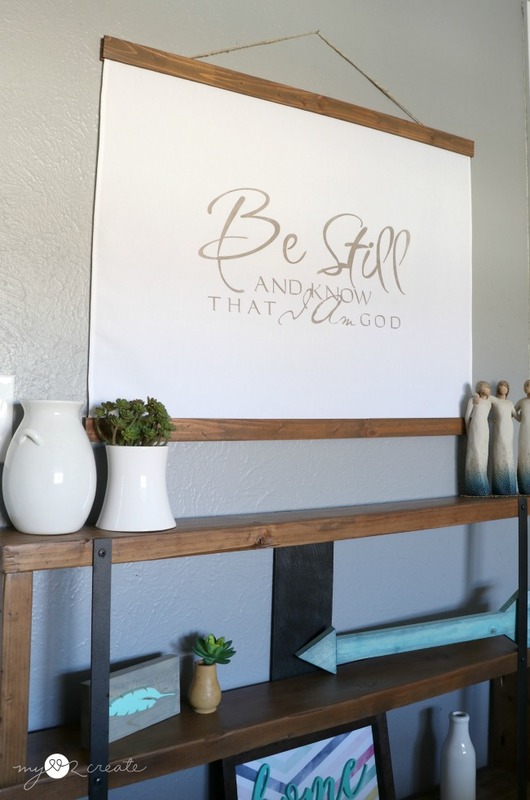 Really sweet sign idea, Mindi! Being easy to make and so lightweight, I think they would make awesome gifts too. Pinning to share. I love how your project turned out. It looks beautiful in the bedroom as well. Great job! Mindi, I would of never guess that to be a fabric wall covering! It is so pretty and perfect scripture.